Fishing is FUN! I don’t understand why women never like it. 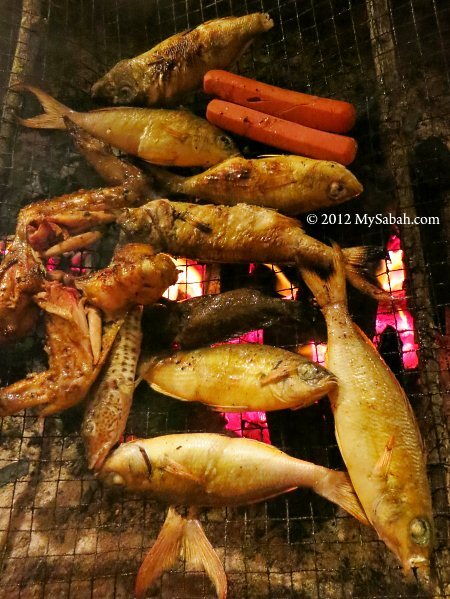 So, for man who wants to get rid of his “sticky” girlfriend, just say you go fishing then she won’t follow you like a Remora (suckerfish), wahaha! 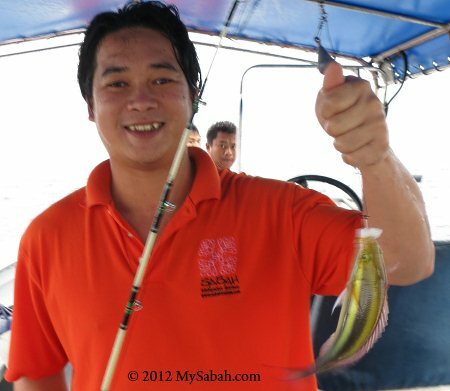 Fishing can be an addictive hobby, and you won’t be short of male companion to join you. During our trip to Mantanani, the Mermaid Island, the guys thought it’s probably a good idea to fish for “mermaid”. Ta-da!!! An angler team (men only of course) was formed in minutes and we couldn’t wait to start. 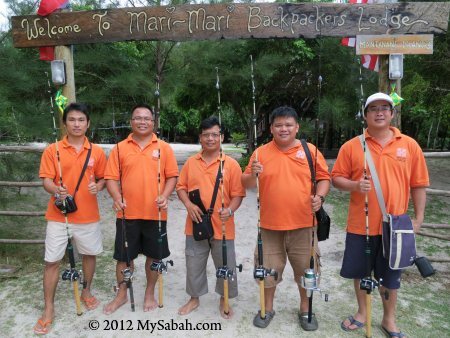 You can book a fishing trip with tour operator of Mantanani Island. 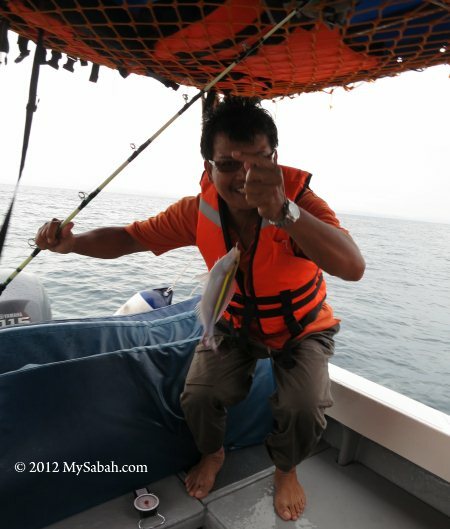 The cost for a 3-hour fishing trip is RM150 (≈USD50) per person. A fiberglass small boat will bring you to a few coral reef areas near Mantanani, where the reef fishes concentrated. The boat provided everything from fish bait to fishing rod. They even taught me how to fish. 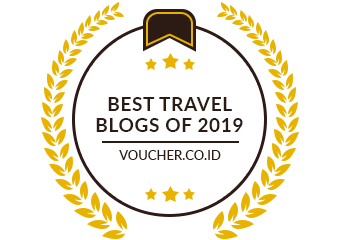 The weather was not good, the sea was rough and it rained. 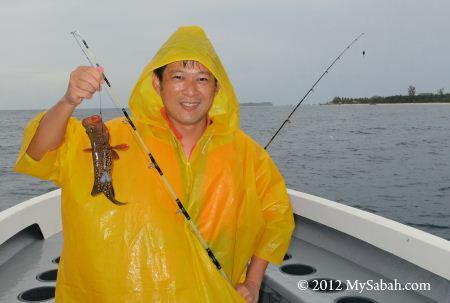 However, it didn’t put off the passion of enthusiastic anglers like us. 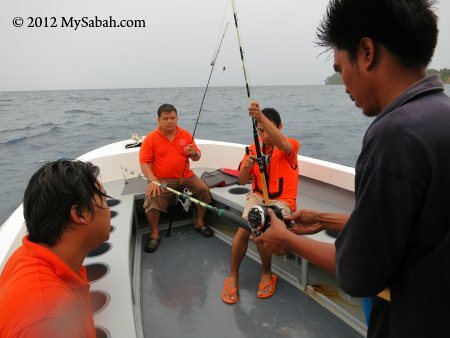 Six of us released the fishing lines at both side of the boat and waited quietly. It didn’t take a long time to hook our first caught. Shortly, we got another fish. 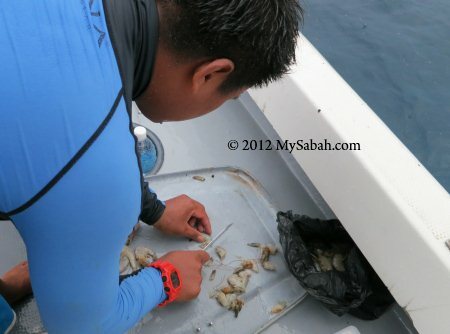 Half of our caught were scad fishes. I also got a grouper. Everyone caught something and we had a great time. We changed fishing location around the island 4 or 5 times. 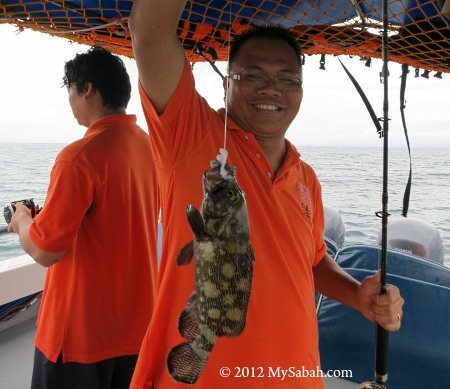 Pic: the caught of the day by Jul, it’s a grouper weight nearly 1 KG. 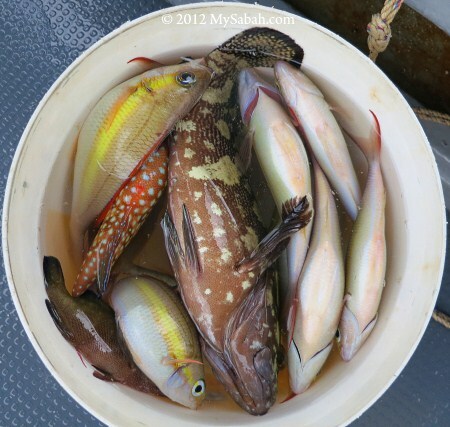 Our bucket was full of fishes! 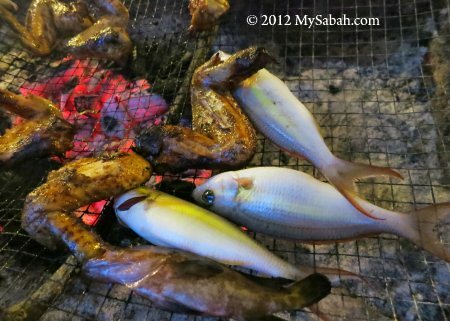 We headed back to our lodge, Sayang-Sayang, just in time for our dinner, so we barbecued the small fishes. 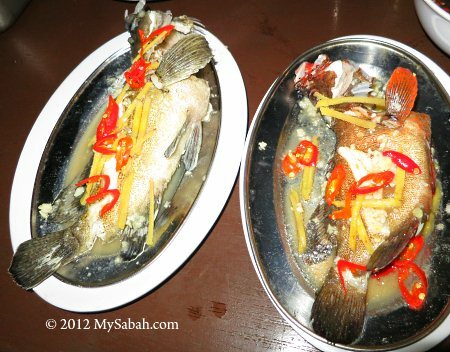 For the bigger fishes, we steamed them. 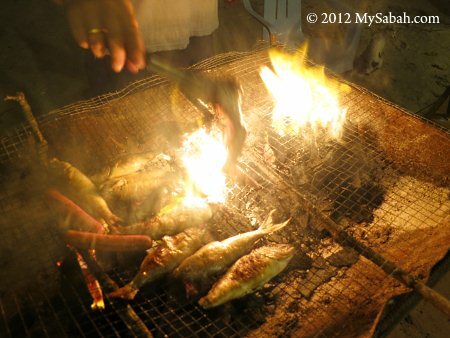 The BBQ fishes are almost ready. Our mouth was watering. Fresh fishes taste best if steamed. 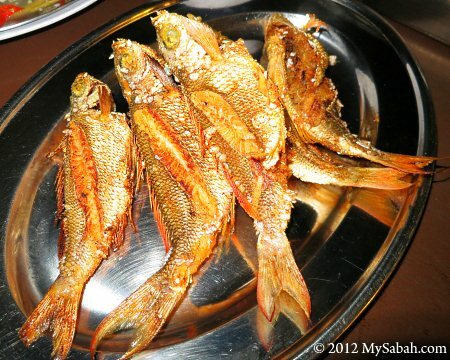 It felt great to eat the fishes we caught than those we bought from fish market. 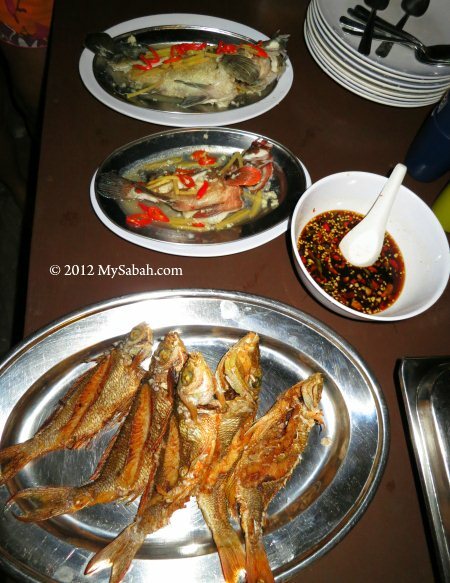 Dip the fish meat into sauce made of small chili, lime juice and soy sauce, and you can taste the heaven, the Sabahan style.